Feeding kitchen scraps to farm animals could spread disease. APHA and Trading Standards continue to find and investigate incidents where farmers and smallholders are illegally feeding pigs and poultry with catering waste, often because they are unaware of the disease risk posed to their livestock by giving them this type of food. 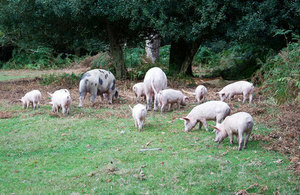 The most likely source of the Foot and Mouth disease outbreak in 2001 was pigs being fed undercooked catering waste containing the virus which originated from outside the UK. The outbreak resulted in the destruction of more than 10 million cattle and sheep, with compensation running into many millions of pounds. It is important that farmers and smallholders help safeguard the health and welfare of their animals by not feeding them with meat, meat products or any waste from kitchens. They should also ensure that farmed animals do not have access to catering waste from any other sources, such as dustbins. The catering waste ban acts as a national barrier to the introduction of potentially devastating animal diseases, and helps reduce the spread of an undetected disease once it has entered the country. Catering waste means all waste food originating in restaurants, catering facilities and household kitchens. Due to the risk of cross contamination, this includes vegetarian kitchens, where products of animal origin such as milk are used in food preparation. EU-wide animal by-product legislation says that the feeding of farmed animals with catering waste or feed material containing, or derived from, catering waste is illegal. A farmed animal is an animal from any species which is kept, fattened or bred by humans and used for the production of food, wool, furs, feathers, hides or skins, or any other product obtained from animals or for other farming purposes. This includes farm animals which are kept only as pets. Horses are also considered farm animals. Guidance on what happens if you suspect notifiable animal disease.